Regenerative periodontal surgery is aimed at regaining some of the previously lost bone support. 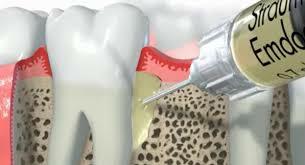 Bone grafting is a way to replace or encourage new growth of bone or gum tissue destroyed by gum disease. A technique that can be used with bone grafting is called Guided Tissue Regeneration, in which a small piece of mesh-like fabric is inserted between the bone and gum tissue. This keeps the gum tissue from growing into the area where the bone should be, allowing the bone and connective tissue to regrow. Since each case is different, it is not possible to predict with certainty which grafts will be successful over the long-term. Treatment results depend on many things, including how far the disease has progressed, how well the patient keeps up with oral care at home, and certain risk factors, such as smoking, which may lower the chances of success. Emdogain® Gel (Straumann) is a biology-based product that promotes the predictable re-growth of hard and soft tissues lost due to periodontal disease. Emdogain is comprised of a number of proteins. The dominant protein in this matrix is amelogenin. Since this protein is involved in the development of teeth, it has been shown to enhance the regeneration of tissue lost due to periodontal disease. Amelogenin has been remarkably well-conserved throughout evolution and functionally consistent in many species. Therefore, although the matrix proteins in Emdogain are of porcine origin, they are considered as “self” when encountered by the human body. In some cases, a bone graft material is applied with the Emdogain. This graft forms a good “scaffold” on which to grow bone.